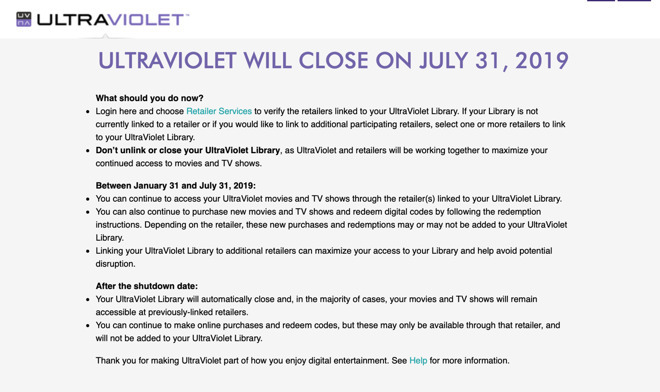 In an email to consumers, Ultraviolet advises that users will continue to be able to access movies and TV shows through retailers linked to their library, as well as to buy new content and redeem codes as usual, up until its closure at the end of July. On the shutdown date, the library will automatically close, preventing any further changes from occurring, but bought content will still be accessible via retailers previously linked to the account. While more purchases could be made or film codes redeemed, they are to be performed solely at that retailer, and will not be added to an Ultraviolet library. The service advises customers to log into their accounts and to select Retailer Services to verify there are online stores linked to the library. It is advised users should not unlink or close their Ultraviolet library, as the service is working with retailers to maintain access to acquired items beyond the closure date. While the iTunes store isn't a retailer that worked with Ultraviolet, retailers who do offer access to Ultraviolet collections do have their own iOS apps for streaming, meaning that some iOS users will be affected by the closure. Approximately 30 million users are signed up to Ultravioet, and collectively store more than 300 million movies and TV shows via the service. Speaking to Variety, Digital Entertainment Content Ecosystem (DECE) president Wendy Aylsworth advised the decision was caused through the changing market for online services. "The marketplace for collecting entertainment content was very small when Ultraviolet started," advised Aylsworth. "It was siloed into walled gardens at the time." Ultraviolet formed in 2011 with the support from most major Hollywood studios, bar Disney. Codes included in DVDs and Blu-ray discs offered to provide a digital version that could be watched online, introducing some users to the idea of streaming video for their paid content at a relatively early point in the life of the general paid streaming market. Its biggest competitor is the Disney-produced Movies Anywhere, which has gained support from the studios that worked with Ultraviolet, with some deciding to cease distributing via Ultraviolet last year. 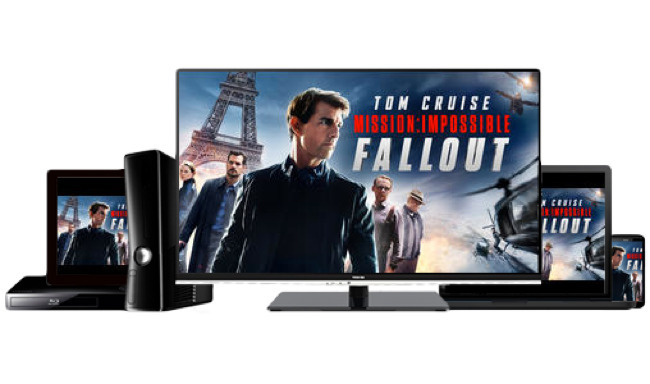 Movies Anywhere crucially also included support for some major digital retailers that didn't work with Ultraviolet, including Apple's iTunes store alongside other major players Amazon and Google Play. While the success of the Disney competitor may have contributed to its downfall, Aylsworth claims the decision to shutter Ultraviolet "doesn't really have anything to do with Movies Anywhere."